Setting a new trend for the service industry. London is finally entering the third wave coffee movement. Although cafes are still riddled with the god-awful Americano and most establishments still don a 1999 illy push button machine, there is rapid change filtering throughout the hipster havens from Brixton and Soho to Shepard’s Bush and even in the tourist hubs around major attractions. If you can find them tucked away, behind large, medieval fortresses or Royal enclaves surrounded in cobblestone you’ll be presently surprised by the style and effort put into theses often shoebox sized cafes. 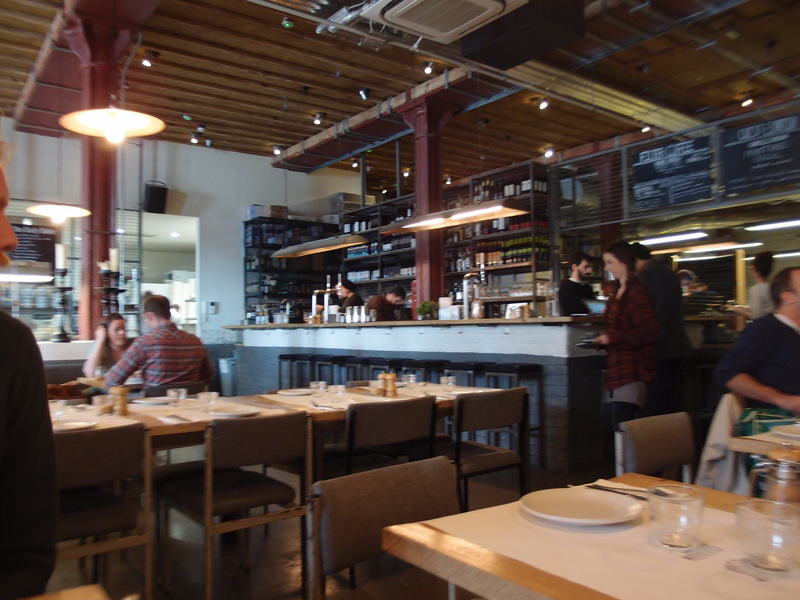 Predominantly coffee and cake, few break the mould and branch out into the brunch scene. One café however is doing just that and biting off more. 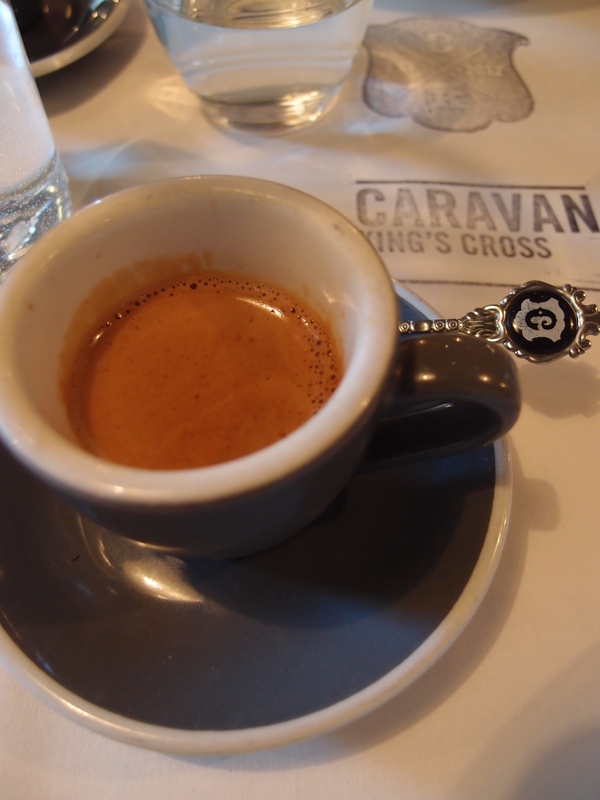 Caravan restaurant, bar and roastery is setting a new standard amongst the food and beverage industry in London Town. 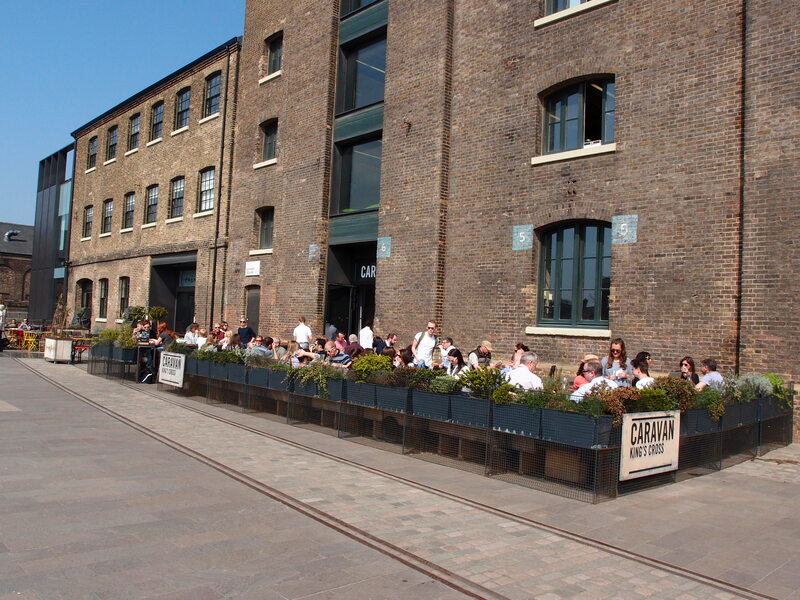 With a base in the old granary at Kings Cross and a satellite store at Exmouth Market, Caravan is a coffee roasting house, a café with full breakfast service, an on-site bakery and a restaurant with a sizable bar. The spacious restaurant, bar and roastery at Caravan. Industrial, with rusted, steel column beams and maintaining the exposed piping, the factory is obvious yet cosy and warm with clean grey lines and low lighting against a high ceiling. The floor space is thoughtful toward the different dining options. Two large communal tables lay out the middle section of the dining floor with bench style rows of two and four seated tables on either side. There is a sizeable breakfast bar alongside the bakery, a large patio-style outdoor setting as well as a fly-in-fly out table next to the coffee machine. Expectedly, the food is full of heart and warmth; with a selective, fresh menu each day. The presentation is also exquisite from a humble carrot cake through to the main dinner meals, the cocktails and of course the coffee. The beans layer the bowl in a deep red ragu, covering a thick slice of chorizo. 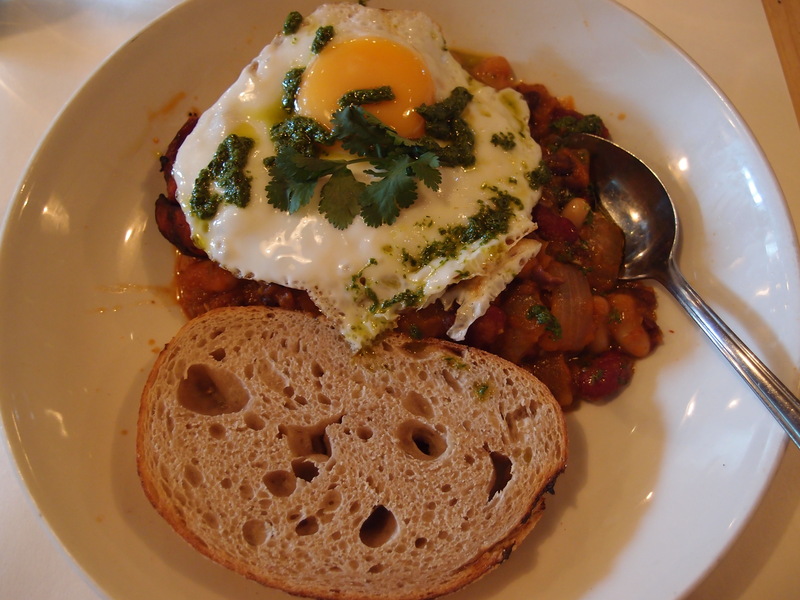 On top, a heavy serving of coriander and a sprinkle of pesto atop the fried egg. A surprise was the sneaky hidden egg. At first, I was concerned I’d been duped an egg, but for clever presentation, the two eggs were layered one under the other, and were cooked perfectly. 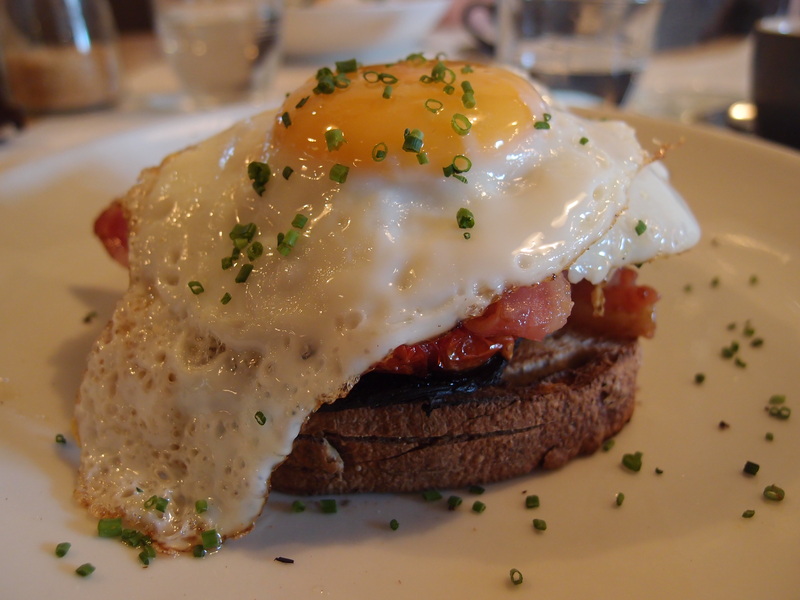 An open, stacked sandwich of sizable proportion; layers of toast, bacon, tomato and thick mushroom topped with two fried eggs. The balance between each flavour was well distributed and rich, nothing too overpowering. The coffee bar offers a large selection, possible with thanks to the on-site roastery and the many eager baristas. With chemex and batch brew to share, offering two unique styles of single origins, the espresso machine, a Strada, churns out full-bodied and lightly roasted traditional coffee. The staff are friendly and welcoming and always happy to chat about their products. Caravan Coffee Roasters has potential to be a pretentious nightmare but I see little sign of anything but friendliness and excitement for their project. Whether you’re dining in for the night, checking out the coffee or dropping in for a quick breakfast, Caravan is very popular so secure your visit with a booking to be sure you can visit. ← Visit Victoria: The spoils of Bendigo putting itself back on the map. Caravan looks like it would be at home in Melbourne! Glad to see that you’re still covering coffee and food across the globe GR, hope all is well and life good.